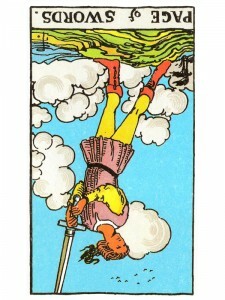 Page of Swords (R) says life is unpredictable – prepare your mind now for the unexpected. Remain receptive to other peoples moods so that you can attend to what you wish to produce. Look deeper into the situations that surround you so that you can fully understand them. See if the actions and behavior of others are aligned with the thoughts and ideas that they are expressing. Prepare your mind for vibrations that could demand quick decisions causing you to act immediately. Trust and believe that all change will eventually be more beneficial. Believe in your mastery of practical thinking and your commitment to quality and excellence. You have detached yourself from a situation which requires more force. You are “limiting” your viewpoint – having become obsessed with your problems and your inability to do anything about them. You require strength, courage and optimism now – expand your mind and exercise it. Renew your perception and revitalize your mind. An extreme distortion of characteristics – overly curious or apathetic – mental stagnation or rambling inefficiency with too much going on. Generating too many ideas with no follow-through. Inefficient communication. What of significance have you just learned through the media? In the first position: Turning fantasy into reality – the mark of a dreamer, the daydreamer especially. Wear padded clothing for bumping into the odd telephone pole now and then. In the second position: Unless you are being paid to push information around, there may be too much here for your purposes. At the other extreme, there may be too little or it may be dated. In the fourth position: All passions can consume us if over indulged and this one is no different. In the eighth position: You are learning lessons directly from mental interaction that will change your material affairs, even your attitude and approach to your health and appearance. You may reject this page or he/she you. In the ninth position: Your heart may be involved with this child, but rather not be, or the opposite, this can be the symbol of your heart’s sadness over this child. What does it mean most of this blessing will be passed through you to others. Why do reversed court cards in the outcome position (10th card) always generate this statement?